Learn more about other innovations by Braskem! Got a project with an impact on the lives of people through plastics or chemistry? Braskem Labs is a pioneering initiative in the Brazilian chemical and petrochemical industry, which encourages entrepreneurs to develop innovative environmental solutions using plastic and chemistry. The goal is to find new solutions and technologies in sectors such as healthcare, housing, mobility, security, etc., generating social impact. The selected projects have access to training and support in the development of the business model, with an emphasis on promoting social impact and financial viability. In the first edition, in 2015, 38 entrepreneurs were benefited, with 30 hours of training for entrepreneurs. At the end of the program, mentors and entrepreneurs responded to a satisfaction survey (NPS, Net Promoter Score) with only one question: “On a scale of 1 to 10, how would you indicate this experience for another person on your level?” The notes were 9.1 by mentors and by 10 the trained entrepreneurs. "The Braskem Labs programs had a major impact in our project. Those were hours mentoring and lectures that helped us improve the future plans of the company, with full support of those involved in helping the selected startups", said Eliézer Machado, the entrepreneur responsible for ColOff. To learn more about the program, access Braskem Labs. The Design Challenge is an initiative that brings together young university students from the Design and Architecture courses that offers students the opportunity to learn from different professionals, learn about new techniques and, at the same time, stimulate creativity. The main goal of the project is to encourage the use of plastic, an intelligent yet not very accessible and exploited solution in architectural articles. In its 5th edition, the Challenge launches a partnership with Fetiche Design, led by Paulo Biacchi and Carolina Armellini, and with Atex, a civil construction company. This edition presents a new proposal: the participants will develop a collection of three pieces (floor, coating and floating walls) that will be made available in the retail, at the second half of 2018. To learn more about the program, visit Design Challenge . Plastic is increasingly instrumental in the packaging composition. Resins made of polypropylene, polyethylene and green polyethylene – made with renewable sources – allow several applications and may acquire new properties via different processes and play a myriad of roles in product presentations. Packaging for hygiene and cleaning products, cosmetics and pharmaceuticals, domestic products, agribusiness and industrial products are just a few examples of their applications, which bring benefits such as strength, lightness, flexibility, and safety. Plastic food packaging have superior performance in product preservation, facilitating consumption and reducing waste. New technologies and new concepts have been developed in the manufacture of intelligent packaging. They are able to make products safer and more convenient. One of the main research fields is plastic packaging, which, including antimicrobial additives, are able to inform whether the content is suitable for consumption – even if they have already been opened. It may seem something for the distant future, but it is not. Braskem already has advanced studies regarding this novelty. Seeking to encourage the plastic packaging market, Braskem launched in 2014 to Let´s Talk Packaging platform, a channel of information on trends, innovation, and design. Learn more about the benefits of plastic for the valuation of products. 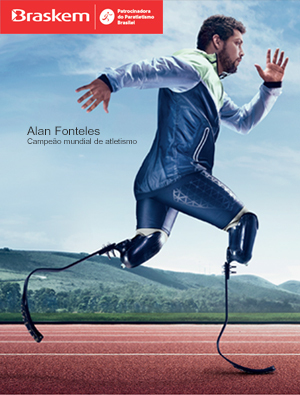 If innovative capacity is important for people, imagine a country? And the future involves chemistry and plastics. For Braskem, innovation is a way of acting in a world that increasingly requires good ideas to survive and perpetuate. 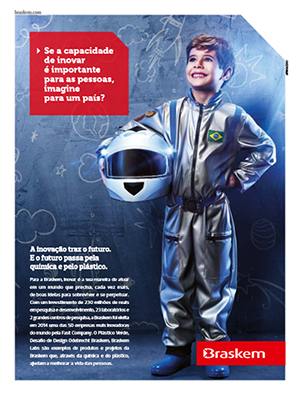 With an investment of 230 million reais in research and development, 23 laboratories and 2 major research centers, Braskem was elected in 2014 one of the world’s 50 most innovative companies by Fast Company. 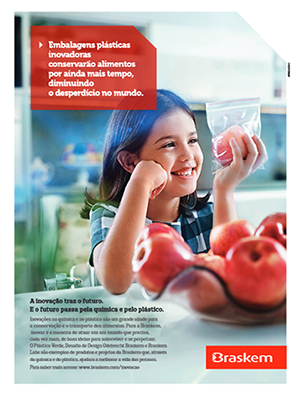 The Green Plastic, the Odebrecht Braskem Design Challenge, and Braskem Labs are examples of Braskem’s products and projects that help improve the lives of people through chemistry and plastics.